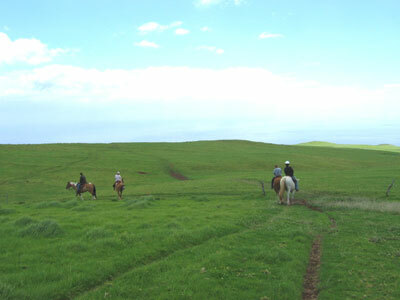 One of the most simple and relaxing ways to discover the more remote areas in the Hawaiian Islands is by horseback. Horses are naturally intelligent animals and that’s a real benefit since you’ll be able to look around and enjoy the amazing scenery while your horse focuses on the following the trail. Another great thing about guided horseback rides are the guides themselves. Most guides are very knowledgeable when it comes to local history, plant and animals, and island geology, and they truly enjoy their jobs and love to share their knowledge with their curious guests. There are many interesting places to ride in the islands and all of them offer stunning natural beauty and great photographic opportunities. On Maui, one of the best places to ride is into the crater of the dormant Haleakala Volcano, where you will be served lunch on the crater floor as you relax and gaze upon the surreal surroundings of cliffs and peaks. Another great ride in Maui is the Haleakala Ranch, which covers a large part of Maui’s high country. Much of these rides take place at higher elevations, which means the air is cooler and views are amazing, as you can see all the way across Maui and far out to sea. On Kauai, there are several great ranch rides to choose from. Princeville Ranch rides will take you past the bluffs of Anini Beach, to the base of a waterfall where riders can enjoy a picnic lunch and then cool off by taking a dip in the waterfall’s pool. On the Big Island of Hawaii you can even tour the famous Parker Ranch. The ranch is a 175,000 acre working ranch which sprawls over rolling green hills and lush valleys. The scenery is stunning, with Mauna Kea rising in the background, sweeping ocean views, and a wide variety of beautiful plant life. So, if you want to have fun, relax, and see the parts of Hawaii that many people never get to see, you really can’t beat a day spent on horseback in Hawaii. You can get up and away from towns, the hotels and restaurants, and the highways and cars. In return you’ll get a taste of the wild Hawaiian back country.